Native Tucsonan Burt Kinerk has dedicated himself to his family, profession and community throughout the years, but it has been sports which has given him that edge of excitement since he was a young boy. He was 9 years old when he was introduced to the game of golf. He played baseball, football and basketball on the County teams, and basketball at St. Peter & Paul Jr. High School where he made the first team, as well as All-City Team. He later played Junior Legion baseball and then varsity basketball and baseball at Tucson High School. At the University of Arizona (1953-57) Bert played baseball, was involved in intramural sports and flag football, and was on the 1956-57 quarterback championship team. He was a member of the Citizen’s Cup team for 49ers Country Club (captain in 1965). Burt is one of the most respected attorneys in Tucson and is well known nationally for his sports management firm which handles many professional athletes, most with local ties. His accomplishments include his co-foundership of the Copper Bowl Foundation and support of the Tucson Boys and Girls Clubs, Kino Learning Center and a host of others. 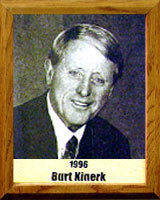 Burt Kinerk continues to demonstrate a love for this city and for sports. He and his wife Nancy have provided us all with an outstanding example of how to live a good life by working hard and giving back to the community.